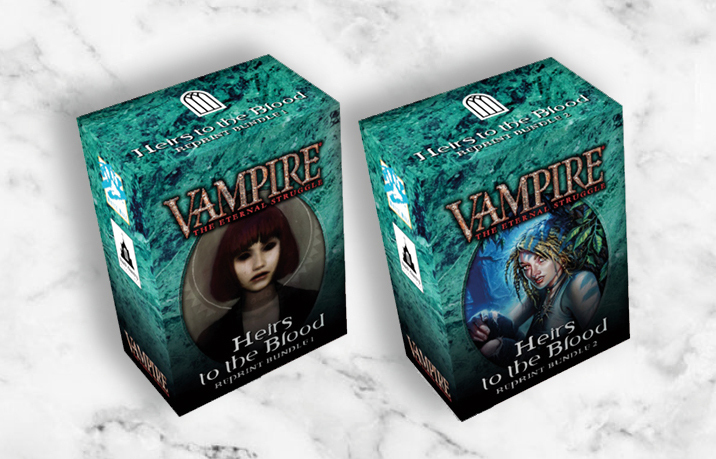 Black Chantry are pleased to announce that Heirs to the Blood tuckboxes and restocks of Keepers of Tradition from the European printers are due to arrive at our European HQ mid-December. Products will hit store shelves December 17 and onward. Heirs to the Blood bundle 1 is focused on clans Baali, Blood Brothers, Gargoyles, Harbingers of Skulls, Nagaraja and Samedi, while Bundle 2 contains clans Ahrimanes, Daughters of Cacophony, Kiasyd, Salubri, Salubri antitribu and True Brujah. Included are also some highly demanded cards useable in many decks, like Cavalier, Dabbler and Wider View. Visit the product pages at Blackchantry.com to see the exact content of each bundle. Next Next post: Welcome European Grand Prix sponsor Ultra Pro!